Most start ups grow incrementally and grow guided by opportunities that emerge in the marketplace. Stage One adopted a more radical approach by investing in a million pounds worth of kit, starting a business called Fluxaxis and then looking for work. Despite the odds being stacked against them, two years later the business has a strong pipeline and is starting to demonstrate impressive sales growth. More interestingly, most of this growth has come from unexpected sectors. The marketplace has turned out to be entirely different in character than anticipated. This presentation tells the story of a newborn start-up becoming a recalcitrant adolescent. The unintended consequences of investing in an arsenal of kit without having a single order makes for a nerve-racking journey. This presentation is not for the faint-hearted. But we do have some splendid lessons to share. 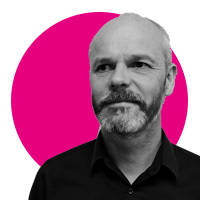 Tim has a background in technology and the creative industries. He works on projects ranging from Olympic Opening Ceremonies to pieces of experimental architecture. He began life as a computer programmer and is now a director at Stage One Creative Services, based just outside of York. He is skilled at helping clients incubate creative ideas to the point at which they can be abandoned gracefully or delivered brilliantly. He has an MBA from Durham University and an MSc in Computing and a BA in Geography. Tim was elected as a Fellow of the Royal Society of Arts in 2016.